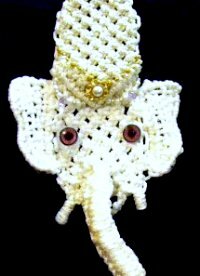 Description: The Ganesha Decoration is the head of an elephant wearing a crown. It is a popular symbol in the Hindu religion, and represents art, science, intellect and wisdom. This is a flat design and is meant to hang on a wall. 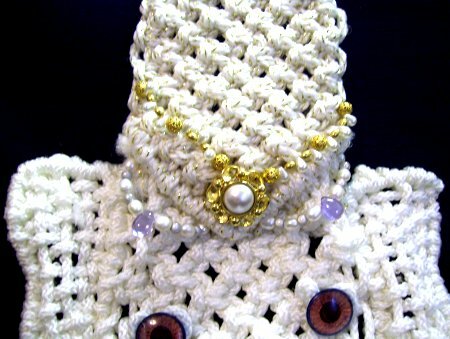 The crown can be decorated with beads and buttons, or with chains of small beads. The finished size is approximately 14 inches tall. 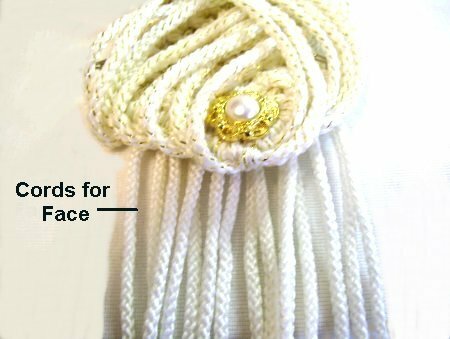 This Macrame pattern is rated Moderate, and is suitable for those who know how to tie the knots used in the design. Crown: Cut 10 cords, each 60 inches long. Cut 1 cord, 12 inches long. Face: Cut 12 cords, each 60 inches long. Cut 1 cord, 36 inches long. Tusks: Cut 2 cords, each 18 inches long (either color). Trunk: Cut 1 cord, at least 90 inches long. Cut one cord, 18 inches long. Ears: Cut 22 cords, each 24 inches long. Prepare the ends with tape, glue or wax to prevent them from unraveling as you work. Step 1: Secure the 12-inch cord for the crown of the Ganesha decoration to your board, horizontally. 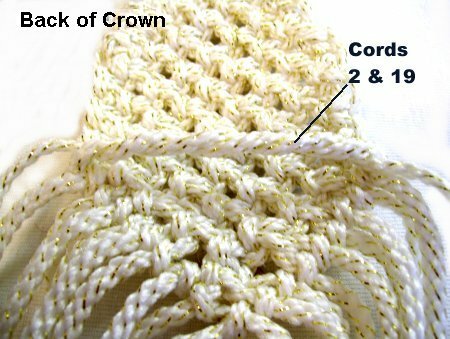 Attach 6 of the 60-inch cords for the crown to it, with Larks Head Knots. Step 2: Tie 3 rows of Alternating Square Knots (ASK). Here's a diagram of the steps you will follow as you make the crown for your Ganesha decoration. Step 3: Mentally number the cords 1 - 12. Add a new 60-inch cord (for the crown) to cords 1 - 2, and another one onto cords 11 - 12. Complete the row by tying the ASK with the rest of the cords. Slide the new cord under cords 1 and 2. Match the ends and center it. 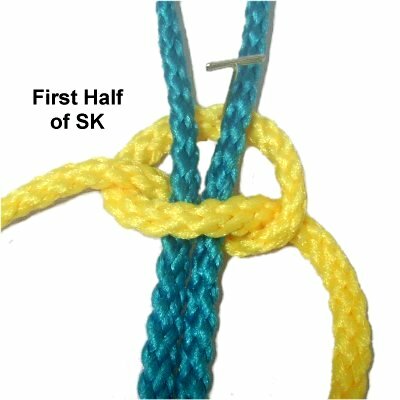 Use the new cord to tie the first half of the Square Knot, onto cords 1 and 2, which are the fillers. Tie the second half of the Square knot. Tighten the SK until it's firm. Now you have four ends to work with. Step 4: Tie 2 rows of ASK. Step 5: Add new 60-inch cord to cords 1 - 2 as well as cords 15 - 16, as you did in step 3. Step 6: Tie 2 or more rows of ASK, depending on how tall you want the crown to end up. Make sure you stop on a row where you use all the cords (1 - 20). Row 1: Tie the ASK with cords 3 - 6, 7 - 10, 11 - 14, 15 - 18. Row 2: Tie the ASK using cords 5 - 8, 9 - 12, 13 - 16. Row 3: Tie the ASK with cords 7 - 10, 11 - 14. Step 8: Add a Button (or a large bead) to cord 10. Pass cord 11 through it as well, if the opening is large enough. Tie the final Square Knot just below, using cords 9 - 12. Step 9: Mentally number the cords 1 - 20. Place cord 1 diagonally along the left edge of the V shape you just made. Secure it so its taut. Attach cords 2 - 10 to it with Double Half Hitches. Step 10: Do the same with cord 20, placing it along the right edge of the V shape. Attach cords 19 - 11 to it with DHH (in that order). 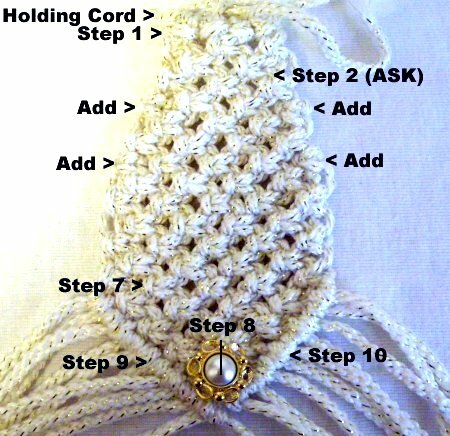 To complete the lower edge of the crown for your Ganesha Decoration, attach one holding cord to the other with a DHH. Step 11: Flip over the crown so you are working in the back of it. Move cords 2 and 19 towards each other so they are horizontal, across the back of the crown. Secure both cords so they are taut, since they are holding cords. Attach 8 of the 60-inch cords for the face to them with Larks Head Knots. Step 12: Flip the Ganesha Decoration so you are working on the front again. Move the cords for the crown out of your way, so you are using only the cords for the face. Tie 3 rows of Alternating Square Knots. Step 13: Mentally number the cords 1 - 16. 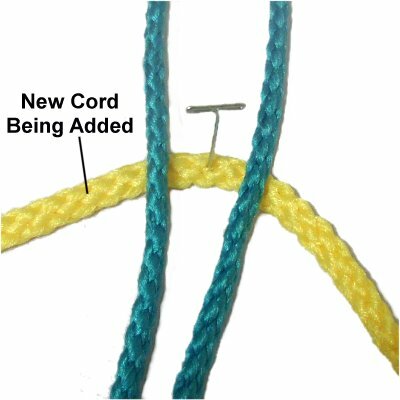 Add a new 60-inch cord to face cords 1 - 2 and 15 - 16, as in step 3. Use the remaining cords to complete the 4th row. Step 14: Tie 2 rows of ASK. Step 15: Add more 60-inch cords to face cords 1 - 2 as well as 19 - 20, as in step 3. Step 16: Tie 3 rows of ASK. Step 17: Mentally number the cords 1 - 24. Tie the ASK using cords 1 - 4, and 5 - 8 on the left. On the right, use cords 17 - 20 and 21 - 24. The remaining cords (9 - 16) need to be pushed to the back of the face for now. They will be used for the trunk of the Ganesha Decoration, which you will make later. Step 18: Tie one row of ASK with the remaining cords. Theres a large gap in the middle now, but the knots need to be tied the same way, across the gap. 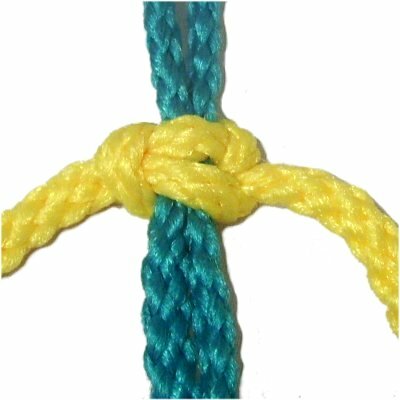 These 3 knots are made with: (3 - 6), (7 + 8 + 17 + 18), as well as (19 - 22). When you pull the cords to make the knot in the center, the face for your Ganesha Decoration will pop out slightly. 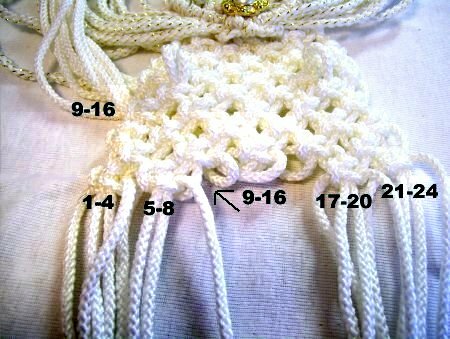 Step 19: Tie the final row of ASK using cords 5 - 8 and 17 - 20. Step 20: At the bottom of the face, locate cords 1 - 4 and 21 - 24. Separate them from the others, since they will be used to make the tusks. Move the remaining cords to the back of the face. Trim the ends to 2-inches and apply glue to hold them to the back of the design. You can use tweezers to work them into the back of the knots if you wish. Step 21: Use the 18-inch cords to make Wrapped Knots around cords 1 - 4 as well as 21 - 24. The right tusk for the Ganesha Decoration should be around 2 inches long. The left one should be smaller, around 1-inch in size. Apply glue to the Wrapped knots and allow it to dry. Cut off the excess material. Step 22: Pass the 36-inch cord through a space in the very bottom of the face, on the left. Center it so the ends are even. Tie a sennit of Alternating Half Hitches measuring 3-inches long. On the right, pass the ends through the face from front to back. Flip over the Ganesha Decoration and tie a tight Overhand Knot to hold the sennit in place. Trim the ends and apply glue to the knot. Step 23: Use cords 9 - 16 to make the trunk. (Cords pushed aside in step 17). 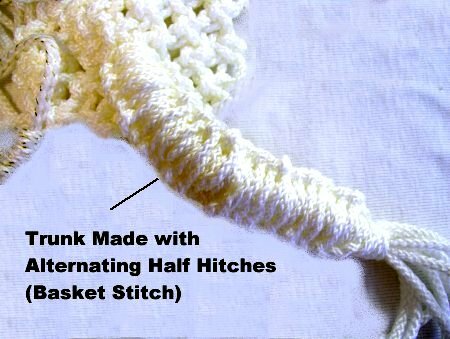 They are the holding cords for the Basket Stitch design. Center the 90-inch working cord under them, matching the ends. Use the 90-inch cord to tie Alternating Half Hitches onto the holding cords. Keep everything flat, so the trunk is as wide as possible. Stop when you have around 4 inches of material left. Use the 18-inch cord to tie a Wrapped knot around ALL the cords for the trunk of the Ganesha Decoration, including the long one used to tie the knots. Make it as tight as you can, and approximately 2 inches long. Apply glue to the entire knot and allow it to dry. Cut off the excess. Step 24: Now it's time to make the large ears for your Ganesha Decoration. Arrange one of the 24-inch cords into the shape of a long triangle, measuring 4 inches top to bottom. The widest part needs to be at the top. That's the area marked with an X in the image. Curve it so it resembles an elephant's ear, which is wide at the top and narrow near the bottom. Mount 10 of the 24-inch cords to the right side of the triangle. 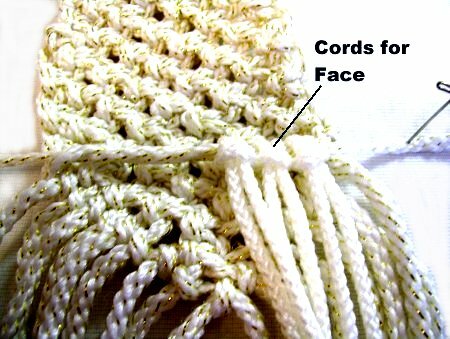 Attach each cord using reverse Larks Head Knots. Step 25: Move the cords across to the left side of the triangle, and attach them with Double Half Hitches. You will need to turn the ear design so you can attach them horizontally. Weave each one through the horizontal cords, moving towards the top of the ear. Attach them to the widest part of the triangle with DHH (marked with an X in the image above). 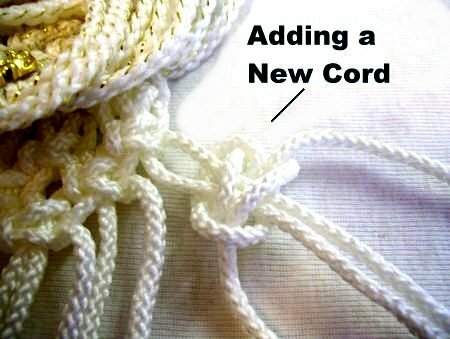 Make sure you alternate the over-under sequence each time you weave a new cord. Step 27: Two cords from each end of the ear need to be kept long, so you can attach it to the Ganesha Decoration. Select those now and push them aside. Apply glue to the back of the knots, all the way around the ear. Let it dry completely. Cut off most of the excess material, applying more glue as needed so the tips adhere to the back of the knots. Don't cut the cords you pushed aside. Attach the top of one ear by passing one cord through a space at the edge of the face, near the top (just below the crown). Pass a second cord through a different space nearby. In the back of the design, tie the two ends together with a tight Overhand knot. Do the same lower down, attaching the lower part of the ear in the most convenient place. Step 28: To make the left ear, repeat steps 24 - 27. Make sure you mount the cords to the left side of the triangle when you first get started. Step 29: Go back to the lower part of the crown and push all the ends through spaces in the face, to the back of the Ganesha Decoration. Trim the cords so they are 2 inches long. Apply glue to hold the ends in place. 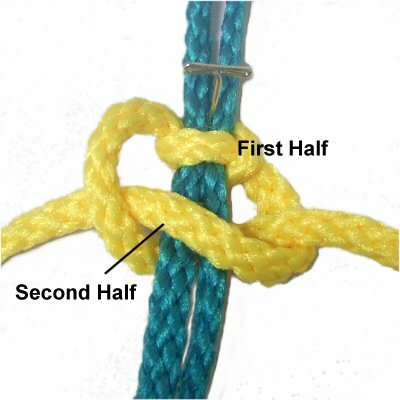 You can tie finishing knots if you wish. Pass the eyes into spaces at the center part of the face. Use glue or washers to hold them in position. Step 30: To decorate the crown, cut pieces of craft wire 12 to 18 inches long. Slide metal or glass beads over the wire, arranged in circles or chains. 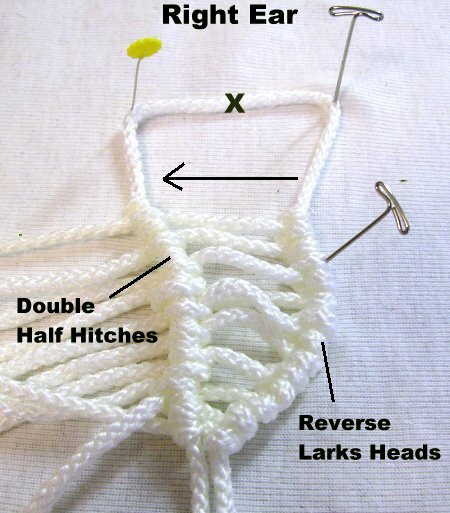 Attach the ends of the wire to the back of the knots in the crown. Locate the holding cord at the top of the crown and tie both ends together with a tight Overhand Knot. Leave a space, and tie a Barrel knot. This will form a loop so you can hang your Ganesha Decoration to a wall. Have any comments about the Ganesha Decoration? Contact Me.